Welcome to BG Electrical & Air Con. We are your local team of qualified electricians and air conditioning specialists in Brisbane. 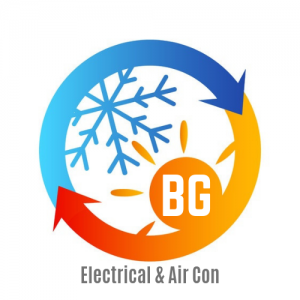 If you are looking for a reliable electrician, and/or air conditioning specialist then look no further, with BG Electrical & Air Con you are in safe hands. We offer a wide range of services in all areas of Brisbane including Inner City and all areas of the Northside and the Southside. We cater to all electrical needs. If it is a small electrical job fixing or replacing a power point through to a full electrical fit out to save on energy bills, we have the experience to do it all. We are your team of qualified air conditioning installers, installing a large range of high quality brands including Mitsubishi air conditioners, Daikin air conditioner, Panasonic air conditioners and more. We install ducted air conditioners, and split system air conditioners, as well as repair ac units & service air cons. At Bg Electrical & Air Con we are your number one in quality air conditioning in Brisbane, we specialise in air conditioning maintenance, air conditioning services, air conditioning installation, ducted air conditioning installation, ducted air conditioning repairs,Panasonic air con installation, panasonic air conditioning installer, panasonic ac installation, mitsubishi ac installation, mitsubishi air conditioning installer, mitsubishi air con installation, mitsubishi ac repair, mitsubishi air con repair, fujitsu air conditioning installer, fujitsu air conditioning installation, fujitsu air con repair, fujitsu air conditioning repair, ducted air conditioning installer, air conditioning installation western suburbs, air conditioning south side, air con brisbane, air conditioning brisbane, air conditioning service, air conditioning maintenance, ac servicing south side, air con servicing brisbane, air conditioning installation brisbane, daikin air conditioning installer, daikin air con installation, daikin air con repair, mitsubishi split system installation, kitchen air conditioning, living room air conditioning, ducted air conditioning, ducted airconditioning, ducted airconditing, bedroom airconditioning, quality airconditioning, reverse cycle air conditioning, western suburbs aircon installer, electrical specilaist, electrical specialists, western suburbs air con installer, western suburbs electrician, reliable air con installer, quality electrician brisbane, reverse cycyle brisbane, south side electrican, airconditioning in brisbane, servicing air con, quality electricians, bne air conditonign installer, brisbane electrician, electrical brisbane, bne aircon installer, aircon services brisbane, air conditioning installation mount ommaney, air conditioning jindalee, air conditioning seventeen mile rocks, air conditioning kenmore, air conditioning coorparoo, air conditioning repairer, air conditioning specialists, all electrical works, maintenance work, electrical jobs, we are your air conditioning specialist and air conditioning experts, switchboard repair, switchboard wiring, mains upgrade, meter board upgrade, mains cable upgrade, meter board wiring, we are your afforable electricians brisbane, we are your afforable air conditioner installers brisbane, switchboard upgrade, safety switch install, circuit breaker repair, fuse repair, circuit breaker upgrade, circuit breaker wiring, cost to upgrade switchboard, affordable electricians, switchboard specialists, fuse board wiring, meter board repair, fuse replacement, mains cable repair, fuse board upgrade, fuse board repair Call Now!